The Keukenhof park is easily accessible from Amsterdam by bus, train and car. Here are all tips how to find your way to the Keukenhof gardens from Amsterdam. The 9292.nl route planner will help you plan yout trip to Keukenhof from any other location in the Netherlands by public transport. Up till 2018 there used to be one bus – Keukenhof Express №858 – connecting Amsterdam and Keukenhof and departing from Schiphol airport. 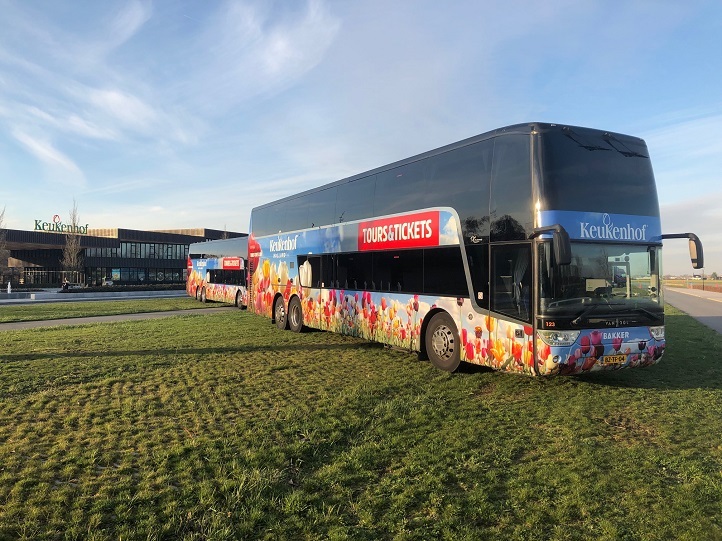 In 2019 there are two extra bus lines to Keukenhof. You can take bus №852 from Amsterdam RAI or bus №859 from Hoofddorp. We recommend to book Keukenhof combi-tickets (entrance + return ticket valid in all busses mentioned on the scheme above) for € 30. It’s cheaper and more convenient than buying single tickets in every bus. Alternatively, you can take a train from Amsterdam Centraal station to Schiphol station (a return ticket costs € 10), and then change to the bus №858 (a combi-ticket from Schiphol costs € 25). line 852 form Amsterdam RAI – 35 minutes. line 859 from Hoofddorp – 20-25 minutes. line 858 from Schiphol – 30-35 minutes. Taking a direct bus transfer bus from Amsterdam can be a good option if you want to travel from the center. 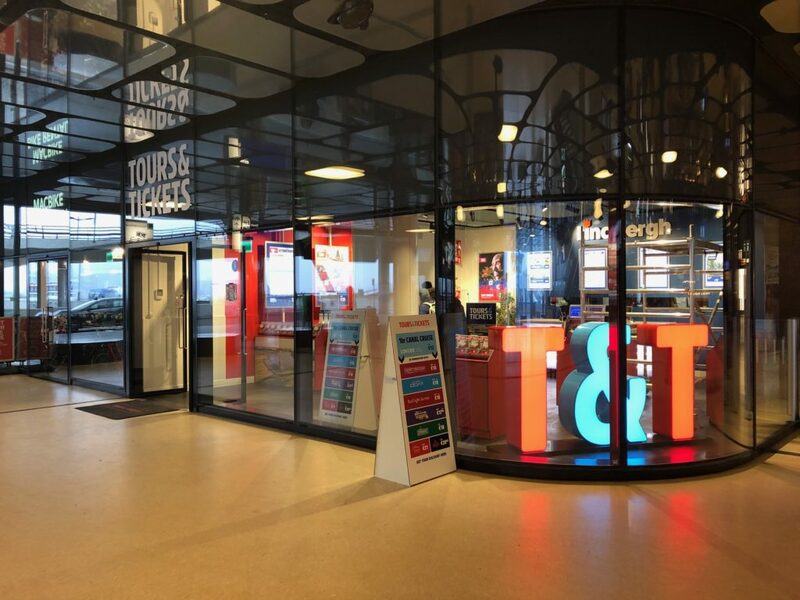 30 minutes prior to the departure you need to check-in at Tours & Tickets office at De Ruijterkade, 34 (inside the building of the Central Train station of Amsterdam). Travel time is around 45 minutes. FAQ about this tour. Prior booking is required. Tickets (€ 39) are available online. Take a train to Leiden Centraal (a return ticket from Amsterdam costs € 19). At Leiden Centraal station change to the bus №854 (Leiden – Keukenhof express). Combi-ticket from Leiden (entrance + return transfer) costs € 25. You can buy train tickets from Amsterdam to Leiden online. An online ticket is valid on the selected day. You can take any local train from Amsterdam to Leiden on the chosen date, there will be no time stated on this ticket (even though the system will ask you to choose the time during the booking process). The Keukenhof gardens are located between Amsterdam and Leiden. To plan your route use Keukenhof’s address in your navigation: Stationsweg 166A, Lisse. It will take you approx. 40 minutes (sometimes more depending on the traffic) to drive from Amsterdam to Keukenhof. Parking costs € 6 a day. Parking tickets are available online. We advice you to buy tickets to Keukenhof online to avoid long waiting lines at the entrance. In 2019 the Keukenhof gardens are open every day from 21 March untill 19 May. The 2019 theme is Flower Power. We would like to visit the gardens on the 21/05/2017, my wife is in a wheelchair and cannot climb stairs into a bus or combi. She can help herself into the front seat of a saloon car, is it possible to visit the gardens by taxi and is there a discount for disabled persons? Hi Stan. Yes, you can definitely travel to the Keukenhof gardens by taxi. 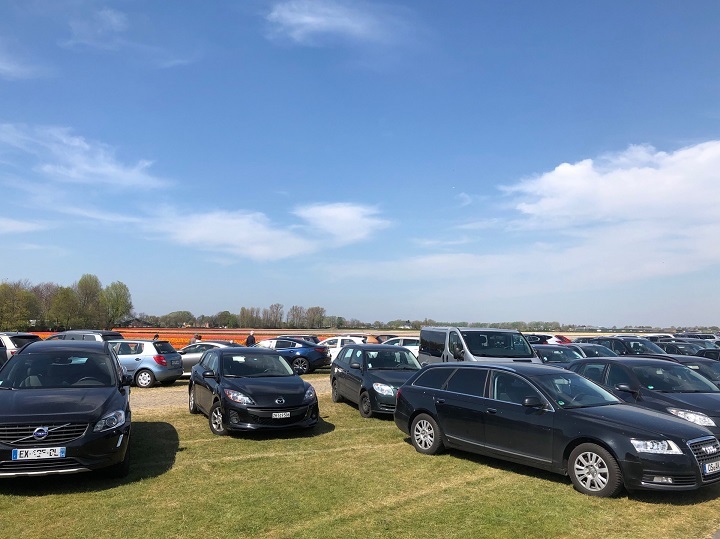 It till take you to the main entrance as no vehicles with the exception of a wheelchair, walker, pram or baby buggy are allowed inside the park. Keukenhof offers good access for wheelchairs and has plenty of disabled toilet facilities. You can also rent an electric wheelchair (costs €10 per day, requires a security deposit of €20 in cash). You can reserve a wheelchair up to the day before your visit at 17:00 at the latest. Unfortunately, there is no discount for disabled persons. Can you use the iAmsterdam Card for transportation to and from Keukenhof? I amsterdam city card is not valid for travel to Keukenhof. However, you can use Amsterdam & Region Travel Ticket, which is valid for transportation to and from Keukenhof. If we have eurail ticket, is it also valid to ride in regional train? As far as I can see here https://www.eurail.com/en/get-inspired/trains-europe/useful-train-information/participating-railway-companies yes, Dutch railway companies accept Eurail passes. But if you have any doubts or need an official confirmation, it’s better to address this question to Eurail customer service. Hi there – We’re so excited to be coming to Amsterdam to see the tulips. We will be taking the bus upon landing from Schipol Airport to Keukenhof. Thereafter, can we take a bus from Keukenhof to Amsterdam without having to return to Schipol? Please let me know if that is included in the combi ticket and which bus I can take from Keukenhof to Amsterdam Centrum where my hotel is located. Thanks so much! 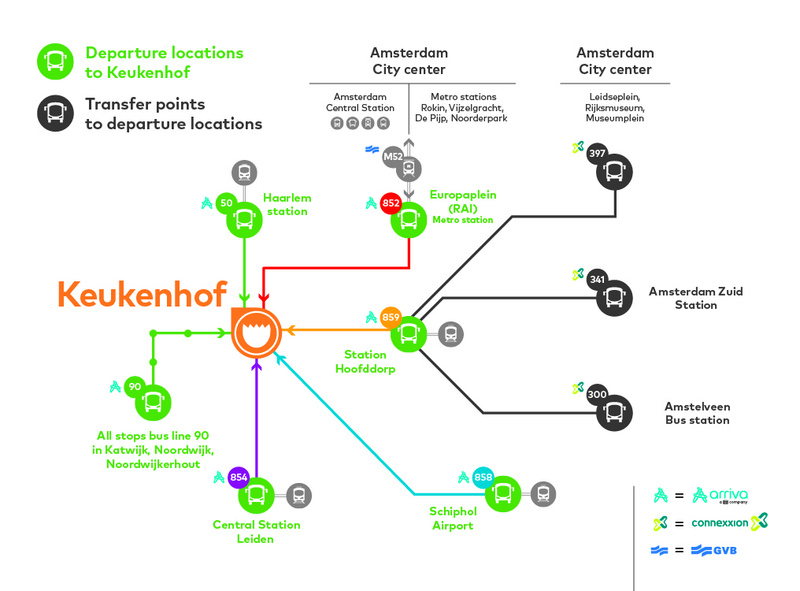 You can use the first one to go back to any of the places listed in the first line, but not to Amsterdam. However you can buy single tickets from the bus driver. A one-way ticket costs €5 in the bus 858 from Schiphol and €7 in the bus 852 to Amsterdam RAI. I guess a direct transfer bus from Amsterdam Central station to Keukenhof entrance would work best for you. You can rent a wheelchair in Keukenhof for free. Here is a link to booking. I’m not sure if it is an electric wheelchair, it’s better to address this question to Keukenhof directly. A € 20 cash deposit is required for a wheelchair. This will be refunded when you return the wheelchair. Unfortunately, we don’t have any information regarding electic buggy’s rental. We are staying at Luxer Hotel and which station will be closest for us to board the bus to KEUKENHOF GARDENS? Thanks. You can check it at 9292.nl. Hi, do we have to print out our combi-tickets to Keukenhof, or can we show them on our phones? we are traveling and don’t have easy access to a printer. You can show them on your phones, that’s fine. Hi, we are wanting to visit the gardens, but do not want to be gone all day. We want a tour that’s less than five hours. Is that possible? Thanks! I would say 5 hours including travel is not such a long time for the gardens, I haven’t seen any shorter trips. But travelling independently is always an option. Keukenkof Express buses depart 4-12 times an hour. Can we catch the bus from any bus stop? or do we have to catch our bus from the specific station? e.g. 397 Bus. Does it have to be from Centrum Station? or any bus stop? You can take bus 397, 300 or 341 on any stop inside the traject described on this travel scheme (black lines). Bus 397 doesn’t stop near the Central station. To plan your route please check 9292.nl. Hello, is it possible to take the GVB metro M52 & the 852 bus or the 397 bus & 858 bus from Amsterdam Central station to Keukenhof using the Conboticket（€30）? This combi-ticket is valid in buses 397, 852, 858, but not in metro line M52. For the shortest route combinations please check the travel scheme in the article or in the previous comment above. Is cash accepted in the Keukenhof express bus to buy single or two way ticket to the gardens? I have bought the entry ticket fo the gardens and also have a gvb pass. Looking for a best possible way to reach there. No, cash is not accepted in the bus, you can only pay with bank/credit card. We want to get a train or public transport to get back to the city centre with our bikes. What’s the best option please? Yes, you can travel back by train (for example from Hillegom station).